When I read your book, I was also reading two other spiritual adventure stories about alternate worlds and realities. When I put those books down, I returned to my normal life. When I put your book down, I was altered. And so was my world. For the better! The cover is beautiful and it gave me the sense of connection. The words you wrote to me felt very loving and I cried with heartfelt emotion of love. Thank you for that blessing. I put your book down once, then I could not put it down again until the end. 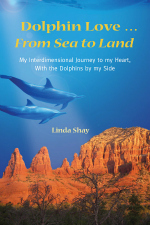 On page 32- Dolphin Healing Energy- I felt waves of energy tingling through my body from head to toe. This occurred several more times as I continued to read. While reading how to open my blow hole, I did the procedure. Shortly after that I sensed a dolphin suspended in the air (or rather floating in the "ocean") just to the side of each shoulder. I then sensed (third eye) a circle of dolphins around me and I was at the center. They began to swim around me, then through me. They were swimming through the center of my brain and about 2 feet in front and back of my head in a figure eight pattern. Yes, this would be the infinity symbol. While this occurred my head was moving rapidly in a similar fashion. This is kind of hard to explain, it's easier to show you my head movement in person, but I think your dolphins will help you see. This event occurred twice while reading your book. They told me these were attunements. I cried about Chuckles spending his life in the zoo. I have since cried more. I never know when it will occur, I just start crying and thinking about his grand sacrifice (yet for him it was an honor to do it). By the way the first time I saw a manatee up close I was overwhelmed with love. Linda, I received a healing while reading your book. Thank you for writing it and being you. I feel I can appreciate your journey because I've been through and sometimes struggle at times with my Spiritual Journey, although it feels easier than the beginning. Thank you for validating my feelings and my knowledge of Being. I just want to say thank you again for writing your book. My dolphins are assisting me in private shamanic healing meditations I am doing on myself in my meditation garden each evening. I do have other guides from the animal world that assist also, however, it's nice to have two friends that are always at my side, ready to help and heal.